What could be more kid-friendly than a tater tot casserole? It's hard to beat the combination of crispy potatoes, savory meat, and melted cheese. This version of the recipe is made with hot dogs instead of ground beef. Sweet potato tater tots are used in this recipe, but feel free to use regular ones if you prefer. You can also use horseradish mustard for this recipe. It sounds like it would be too spicy for the kids, but it's such a small amount so it just lends a background zippiness to this casserole. Use your own judgment. If your kids really prefer less spice in their foods, use the yellow mustard instead. Place the baked beans in a 1-quarter casserole dish. 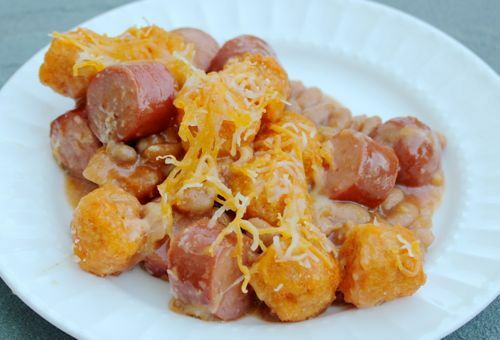 Slice the hot dogs into 1/2-inch pieces and place on top of the baked beans. Add the mustard, and stir. Sprinkle the cheddar cheese over the hot dog mixture. Top with the tater tots in a single layer. Bake 25 to 35 minutes, until the cheese is melted and the tater tots are cooked all the way through.